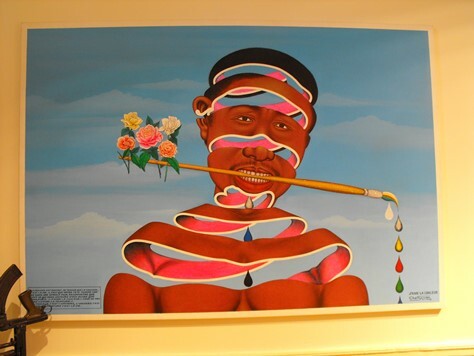 This is the very first art fair solely dedicated to modern and contemporary African Art, and it is currently taking place at one of London’s most famous landmarks, Somerset House, from the 16th to the 20th of October 2013. Called 1: 54, the 54 countries that constitute the African continent are welll represented at this event and the VIP event was well attended by galleries, art dealers, curators, artists and art lovers. It has taken a long time for such an event to hit London and the director of Tate Modern London, Chris Dercon, with whom I spoke, thought it’s a brilliant idea, and said he’s excited to see such a wide range of art works from across the continent and outside of it. Among the dignitaries I spoke to was a colleague from the Royal College of Art - the world famous Nigerian-born artist Sokari Douglas Camp CBE, who was shortlisted for the 2003 Trafalgar Square Fourth plinth - and one of the first female African artists to have attracted the attention of the international art market. Her works at the fair included two sculptural pieces. The art fair is set to cash in on the popularity of contemporary African art and showcases an emerging African art markets to galleries, art dealers, enthusiasts as well as culture-seekers alike - allowing them the opportunity to experience the wealth of contemporary African Art with a very high level of standard and presentation. Other highlights of the fair will be Edson Chagas, whose work was featured in the first pavilion of the Republic of Angola at the 55th Venice Biennale 2013, and which won a Golden Lion - the highest accolade at the Biennale, making Angola the first African Country to win the award. Other notable artists include Meschac Gaba, from Benin Republic, whose Museum of Contemporary African Art installation has recently been acquired by Tate, and Mr Gaba himself is also an internationally-acclaimed artist. Then there is Aboudia , from the Ivory Coast, whose powerful political paintings have been acquired by major collectors worldwide including the Saatchi gallery. And Sammy Baloji, from the Democratic Republic of Congo, whose work won two awards at the African photography Encounters in Bamako in 2007 and exhibited at Tate Modern in 2011. Godfried Donkor a Ghanian born London based British artists whose work represented the first African pavilion at the 2001 Venice Biennale, is also represented and is works are part of the collection at the Smithsonian National Museum in Washington D.C. The founder of the Art fair is Touria El Glaoui, the daughter of celebrated Moroccan artist Hassan El Glaouui. To mark the inaugural year of the fair, the critically-acclaimed Ghanaian–born architect David Adjaye, will hold a critical conversations programme organised by the art fairs director Koyo Kouoh, a Dakar-based Cameroonian–born exhibition maker and founder of Raw Material Company. The extensive programme aims to feature a full educational lectures, film screenings and panel discussions presented by international curators, artists and experts in the field, looking at economies collections, artistic practice and Africa as an inspirational play ground. Contemporary African Art Fair Somerset House London 16th -20th October 2013. Juliette Ingrid Goddard MA (RCA) is a crtitically-acclaimed artist and art critic who has exhibited internationally. Her artistic talent as a young student earned her a prized place at the Royal College of Art.